We are delighted to announce that the first performance in the fretless electric guitar project will be on Thursday 5th November 2015 at Colchester Arts Centre. Juxtaposed with these will be a set from the vLookup Trio. 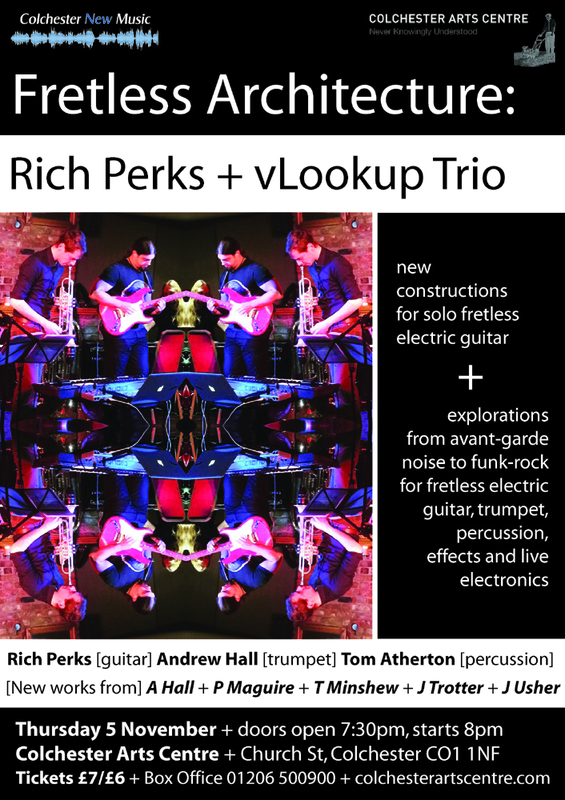 Comprising Rich Perks (fretless electric guitar), Andrew Hall (trumpet) and Tom Atherton (percussion), this group explores pieces which combine pre-composed material with improvisation in styles that range from avant-garde noise to funk-rock, whilst also pushing the sonic possibilities of a trio instrumentation by incorporating effects and live electronics. Listen to some recordings of the Trio here. See here for full details of the performance. This entry was posted in Articles, Concerts, performance, Upcoming concerts and tagged Colchester Arts Centre, Fretless guitar, Rich Perks, vLookup on July 18, 2015 by AlexanderBlustin.